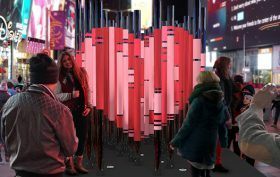 Times Square is abuzz this month with a new film by Alex Da Corte for #Midnightmoment and the unveiling of the annual Valentine’s sculpture—this year’s piece an interactive work that honors the diversity that immigrants have brought to New York. Also this week, head to the National Arts Club for all the gossip Marie Antoinette shared with hairdresser; check out minimalist illustrators at Spoke Art; then stop by Lincoln Center for this year’s New York City Ballet artist collaboration. Untapped Cities is also offering an underground adventure that will take curious straphangers into the depths of the NYC Subway. Finally, treat yourself to the decadence that is The Art of Food at Sotheby’s, an evening of delicious treats inspired by master artworks made by leading chefs!